I am writing this from the air-conditioned comfort of a garden facing room at the homely yet modern Laguna Anjuna Resort at Goa. Goa is a paradise for all those who love the sun, the sea, the sand and the surf. Laguna Anjuna is a short walk away from Anjuna beach, one of the many beaches that dot the coastal highway from Goa to Kerala. Anjuna is one of several tourist attractions at Goa. One can find old wooden houses and narrow streets with antique shops and several traditional Maharashtrian and Goan restaurants overlooking the bay. As one walks along the mud road that leads to the beach, one can meet tourists from all over Europe, bargaining with the vendors at the colourful kiosks that dot Anjuna beach. One can find several shops selling handicrafts, sarongs and bermudas along the street corners. As one heads towards Anjuna beach, one walks under the canopy of giant trees that surround my cottage. One passes several ancient tile-roofed houses along the way. Goa is dotted with several beautiful beaches and the colour of the sea is turquoise. Several coral islands are scattered around the coast and are easily accessible by boats. The beach at Anjuna is a relatively quiet beach. The sea is calm and the greenery starts where the beach ends! 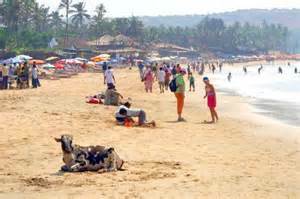 Fatrade beach is another beach at Goa located in South Goa. Calangute, Baga and Vagator beaches are just a short drive away from Anjuna which is located in North Goa. The view from the resort is exceptional. The cobalt blue waters of the Arabian Sea stretch from horizon to horizon, the snow white clouds suspended above the water. The light blue sky, offers a stark contrast to the waters. The crimson sunset streaks the clouds with a golden hue. Watching the sun set over the waters is a memorable experience. Capturing this elusive moment on your digital camera is a challenge! There are several beautiful beaches near Goa but the most beautiful of them is at Anjuna. This beach boasts of gentle waves, clear transparent waters and a magnificent view of the verdant hills that surround this oasis of tranquility. The view from the beach is soothing to the eyes. Rust coloured sands, stretch for kilometers on end. One enjoys soaking in the warm waters of the sea, feeling the gentle waves lapping at your feet. Once the novelty of the water wears off, one can explore the beach which is full of rocks. A few stalls selling souvenirs, coconut-water and snacks surround the beach. The view from Anjuna beach is picturesque. One can see the silvery sands, the wide arced bay, the swaying palms and the green treetops. The ocean breeze is cool and rejuvenating. Meditating here is a divine experience. Sitting on the rocks and creatively visualising one's goals at dusk is a powerful experience. Anjuna is an ideal setting for powerful self-affirmations termed auto-suggestion in ZeNLP. It is difficult to believe that a short drive from Tivim station, will bring one to an almost secluded cove surrounded by pristine pure waters, white sand and colourful corals. In a region as lush as Goa's coast one would expect to see a rain-cloud or two at certain times of the year. There is a rainy season but not day-long torrential rain, but a few isolated showers towards the evening. Goa is a year round destination where beaches are open regardless of the weather. The beach at Anjuna is a rust-coloured flat beach and is ideal for meditation. One can be alone with the elements and enjoy peace,tranquility,serenity and calmness while relaxing on the edges of the water. At six-monthly intervals, there is a gentle swing in the winds from the south-west to the south-east. Thus, if one beach faces the wind and breakers, another is blessed by calm waters and soft breezes. Almost all afternoon drizzles are followed by strong cooling breezes from the ocean. Fatrade is the popular beach after Anjuna and Calangute. Beach children love the surfy waters of this paradise on earth! The nearest international airport to reach Anjuna is at Mumbai. There are several options for Indian tourists to get to Goa from Mumbai. There are several trains available to Goa from Ahmedabad and Mumbai. Laguna Anjuna is a 30 km. drive from Tivim station and Anjuna beach is located 1 km. away from Laguna Anjuna Resort. 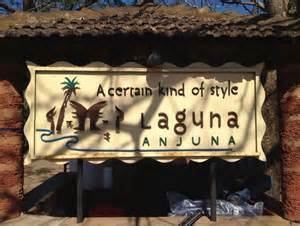 Laguna Anjuna Resort is an affordable place to stay. They are extremely affordable by Indian standards during May-October which is a low season. A standard double-room costs approximately. Rs.2500 (inclusive of breakfast). 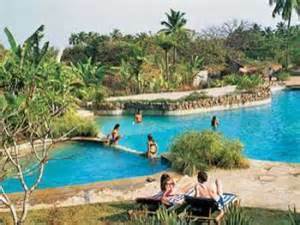 Budget conscious Indian tourists frequent this eco-friendly resort at this time of the year. The rooms are spacious and can comfortably accommodate a family of four (with extra beds). The bathrooms are comfortable with hot water showers. Few small restaurants serving pure vegetarian Maharashtrian cuisine dot Goa. Freshly steamed green peas with coriander and coconut, served with chappatis baked in an earthen oven, is a local dish which melts in the mouth. Boiled potatoes with ginger and fenugreek leaves is served with boiled white rice at Anjuna beach. The food at the high profile restaurants is only for the gastronomically adventurous who like greasy food floating in oil. Fresh fruits including mangoes, tender-coconuts, bananas and jack-fruits are available at the local market. Araku Valley is a paradise for all those who love the sun, the mist, the clouds and the hills.